Sergeant Daniel Harter of the Lawton Police Dept. 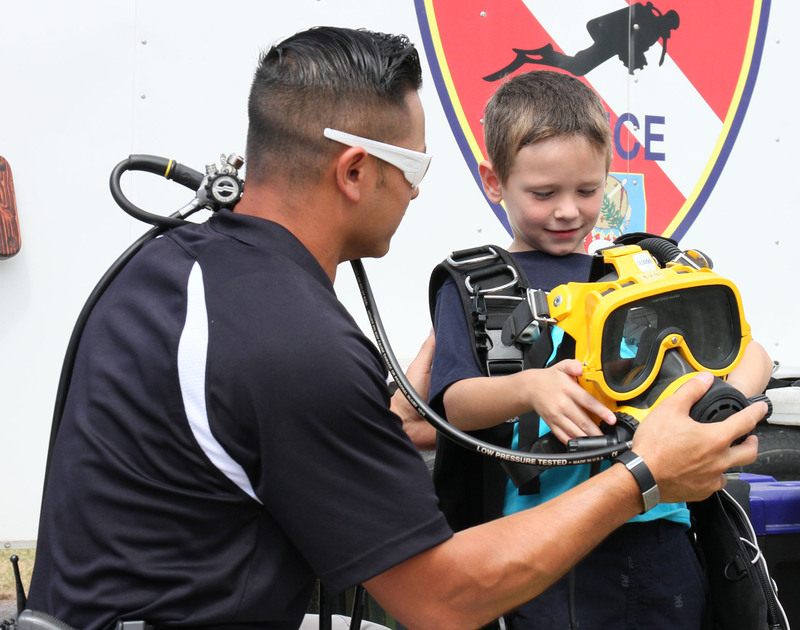 lets a boy hold a buoyancy control device at the Cops N’ Kids Picnic on Sept. 12. 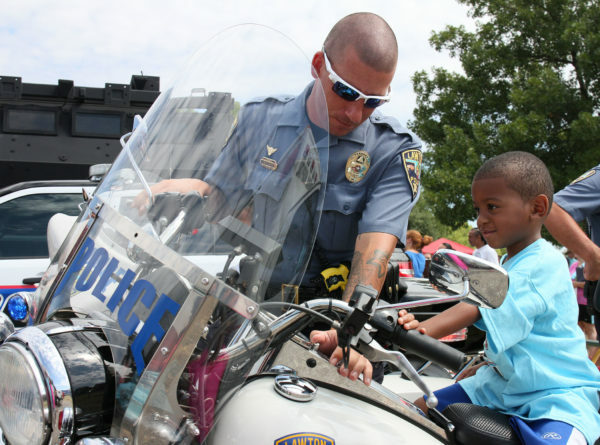 The Lawton Police Department hosted its annual Cops N’ Kids Picnic from 10 a.m.-1 p.m. on Sept. 12 at Elmer Thomas Park. The event featured live music, games, bicycle raffles, an antique car show and an Impact Zone Wrestling demonstration. 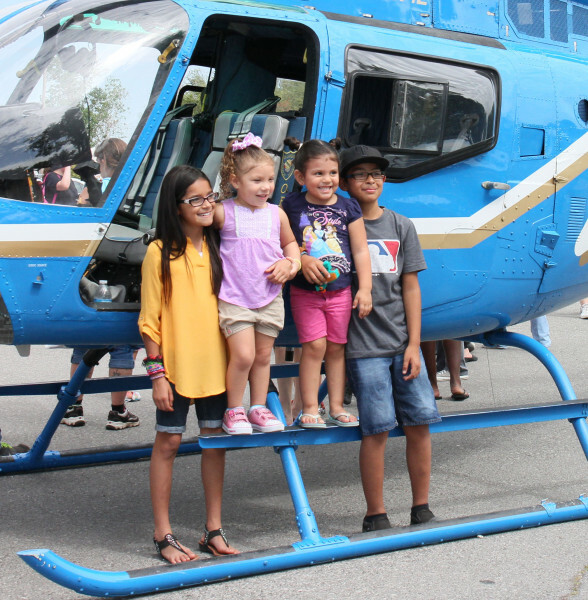 Members of the LPD, Oklahoma Highway Patrol and other regional emergency departments were on hand to demonstrate various gadgets and vehicles their departments use to serve the public. Participants had the opportunity to interact with the officers and experience aspects of the job like riding in a police car and wearing scuba diving gear. According to LPD Sergeant Stephanie Crawford, the picnic aims to bridge the gap between the police and the citizens within the communities they serve. Several Cameron organizations volunteered at the picnic, including the Alpha Sigma Phi fraternity who helped set up, distribute beverages and provide information to attendants. Jermaine Ford, a criminal justice major and member of the Alpha Sigma Phi fraternity, said the picnic is a positive event for Lawton because it reduces the hesitation people often feel to call the police. “The event is important because a lot of times people are afraid to call the police because they are made to be their enemies,” Ford said. “There’s so much negativity and shadow on the police, but it takes something like this community oriented event to get the people familiar with the police. For Sgt. Crawford, the event was a success, and she was pleased to see the impact it had on the community.